I receive a lot of questions about Royal Icing on daily basis. I put together a list of popular questions. If you can’t find an answer in my Royal Icing FAQ below be sure to message me and I will be glad to help you to the best of my knowledge. 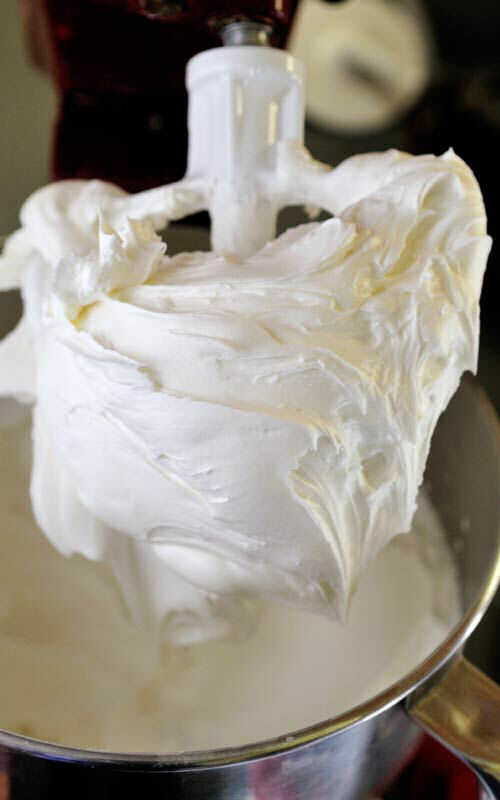 How do you make Royal Icing, do you have a recipe? 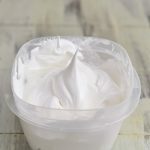 What is meringue powder and where can I find it? Meringue powder consists of dry pasteurized egg whites, cream of tartar and in some cases also corn starch to prevent clumping. Check the label on the packaging, each brand ingredients can vary slightly. Meringue powder is available at Crafts stores or specialty bakery store or online. What brand of Meringue Powder do you use? I use Wilton brand meringue powder. 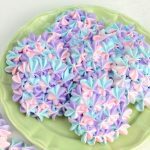 I don’t have a meringue powder, can I use raw egg whites to make royal icing? You can use pasteurized Liquid Egg White products or pasteurized shell eggs. Always use shell eggs from credible sources. You can also try using Vegan Royal Icing instead. 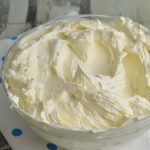 Why are you adding cream of tartar? 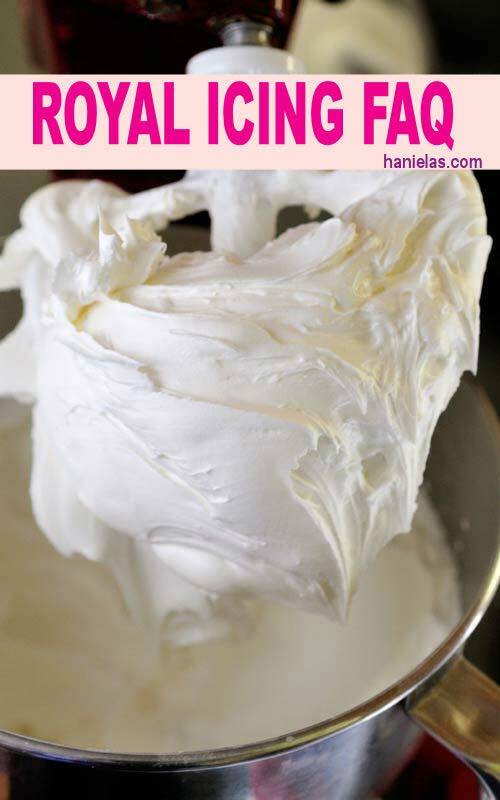 A lot of times Meringue Powder already has cream of tartar so you if that’s the case you don’t need to use it. I add extra cream of tartar to further stabilize royal icing. My royal icing is not stiff like yours, should I add more powdered sugar? Yes, try adding a little more powdered sugar. If you are adding more than 4 cups, be sure to add 1 more tablespoon of meringue powder. What if I don’t like lemon flavored royal icing, can I use something else instead of lemon juice? You can omit lemon juice and use water instead. Can I flavor royal icing? Use alcohol or water based flavorings. Oil based flavorings can cause some issue with drying. Royal icing can be stored at room temperature for up to 2 weeks. I store my royal icing in the fridge in an airtight container with a piece of plastic wrap tightly covering the top, with the lid. I store it in the fridge as it doesn’t separate as much. How long does royal icing keep? How can tell icing is bad? Icing that has gone bad has a sour smell to it. Gasses created in the icing cause solids to puff up significantly and often pressure can cause the lid on the container to pop. If you suspect icing is bad, toss it and make a new batch. 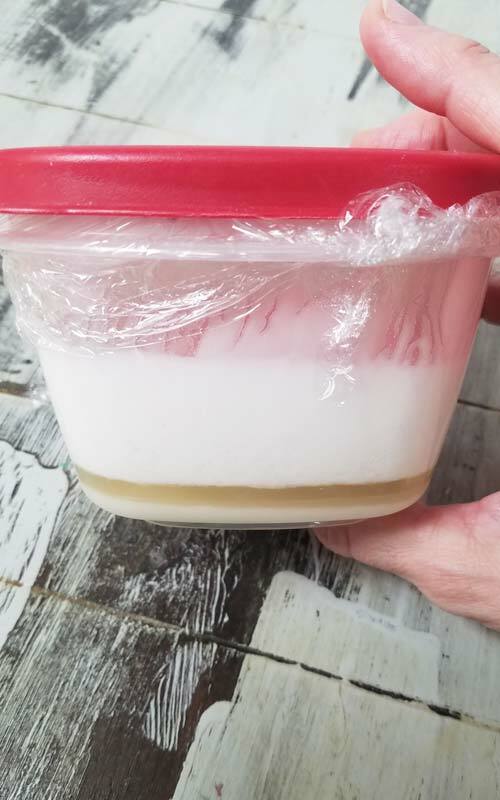 I made my royal icing 7 days ago now there is liquid on the bottom of the container, is my royal icing bad? This is called separation, liquid separates from the solids, yellowish liquid on the bottom of the container is normal. You just need to remix the icing. More liquid is added to the icing more visible and faster separation occurs. How do you thin royal icing to different consistencies? I use a spray bottle and room temperature water to thin royal icing. Spray bottle works great as it eliminates adding too much water at once. This is a common problem and I highly recommend spray bottle method to thin royal icing. What does 10, 15, 20 second consistency mean? It is a term we use to specify the fluidity of royal icing needed for completion of different cookie decorating designs. For example 15 second consistency refers to icing when you run a spatula though separation line will disappear in about 15 seconds. Generally flood icing is 10,15,20 second consistency. Flood icing is used to ice the cookies creating a smooth finish. Piping consistency is thicker than flood icing. When you pull the icing with the spatula up peak should slowly fall down but it never becomes completely blended with the rest of the icing. I have air bubbles in my icing, what to do? When mixing icing, especially when you are thinning it down for flooding, sometimes with all the mixing we mix in air, creating air bubbles. This is normal. Cover icing with a plastic wrap and let sit for 20-30 minutes, bubble usually rise to the top. Slowly stir to pop as many air bubble as you can. You can also bang the bowl on the counter top, this can also pop some of those stubborn bubbles. If you notice bubbles after you filled your piping bags tap the piping bags from all directions. Pop the bubbles on freshly iced cookie with a needle tool. How long can you keep icing in the piping bags before it starts to separate? Icing in the piping bags that has been thinned down can start to separate in as early as 4 hours. No need to panic, you can gently massage a piping bag to remedy separation. If you had icing in the piping bags for over a day, it maybe necessary to remix it with a spatula. What kind of food colorings do you use? I have used Wilton, Americolor, Chef Master food colorings. These days I mainly use Americolor brand and certain colors from Wilton, too. There are also all natural food colorings available on the marked. Whole Foods store carries some and you can also purchase them online. How do you make Red royal icing? If starting with white royal icing I add Super Red gel food coloring by Americolor brand until icing turns red with a pink hue. Let the colored icing overnight and best for couple of days at room temperature. As the colored icing matures it deepens in colors. After this if your icing is not desired red color you can add little more food coloring. How do you make Black royal icing? Another trick is to add 1tbl cocoa powder(not more) per one cup of white royal icing. So your starting point is not white icing but light brown hence less black to color icing. It also tastes super yummy. Then add black food coloring and continue with the same process as states above. Make sure you don’t add too much cocoa powder as it can affect how royal icing dries and pipes. Do I need to cover iced cookies or put them into the fridge? How do you dry cookies decorated with royal icing? I place cookies on a tray and and let them air dry overnight. To speed up the drying process you can use a fan to promote air circulation. It really helps with faster drying. I only use the fan in a closed room, along with the ceiling fan. Always make sure fans are clean so you don’t have dust flying around. Try not place the fan too close to the cookies, though rare you may experience rippling on icing. Don’t cover cookies with anything. Leave them at room temperature. Don’t put them into the fridge. You can also food dehydrator to dry icing, be sure to do few test runs to ensure you know how quickly it takes for the icing to dry when using food dehydrator. Cookies can dry fairly quickly. You can also use heat lamps and small portable heater to promote faster drying. It’s really humid, my icing is not drying fast enough? If you can, use dehumidifier to help manage air humidity. It is best to dry cookies in a closed room with the dehumidifier running. You can also follow additional tips mentioned above with the use of fans. You can also accelerate drying by preheating your oven the lowest setting, then turn off the oven and place cookies on a heat proof tray/baking sheet into the oven for 10-15 minutes. This helps to develop the crust faster. Royal Icing won’t dry at all, what to do? Well, this only happened once. It happened with black icing. Truth is I don’t like to use black coloring much. But sometimes designs look better with a black outline or there is a project that requires black and you can’t help it. Black and red are known to give issues in high humidity especially if you use too much food coloring. Use a gel food coloring that you trust. Sometimes that is all it takes, and as I mentioned before let the colored icing mature, this will eliminate excessive use of food coloring. How long does it take for cookies decorated with royal icing to dry completely? Depending on the size of the cookies 6-10 hours. You say “let the icing crust” a lot. What does it mean? Crusting simply means that icing develops a shell like layer on the top. Don’t be fooled it’s still wet underneath. This crusted layer allows you to pipe icing on the top of it without it sinking into the base layer. This step is especially crucial when creating dimension. Based on the size of iced sections it can take 10 minutes to 60 minutes or longer if decorating large cookies like gingerbread house panels. I have hairline cracks in my icing, how do I prevent this from happening? Hairline cracks are an easily preventable. I find they have a tendency to occur on larger and fully iced cookies that haven’t developed thick enough crust to be moved. For instance : you iced a 5 inch cookie with a base layer. Then you let it crust for 30 minutes. Crust has formed and it looks perfectly fine to add a pretty bow on top of the base layer. As you move the tray with cookies and place it on a table or lift individual cookies by hand this can disrupt the icing and causes hairline cracks. At the end of the day this is not a big deal, they are hardly noticeable. Try to eliminate moving the cookies while the icing is crusting/drying. Where do you get your Edible Pens? You can look in my Shop page, they are listed there. Is it safe to use markers to draw on royal icing? Only use food edible pens. These pens are designed to be used with food. Perfectly safe to use. RIT stands for royal icing transfer. These are decorations made from royal icing. They can be made ahead of time. Royal icing transfers are used for decorating cookies cakes and even cupcakes. Most common royal icing transfers are piped royal icing flowers. These are usually 3 dimensional. You can also make royal icing transfers that are flat. They are piped on a piece of wax paper, parchment or if preferred food grade acetate. They need to dry overnight and sometimes even longer. When icing dries, backing sheet is removed and royal icing transfer is ready to be used. Why is my black royal icing bleeding and how can I prevent it? with dark colors, like black and dark red. Try letting dark color icing rest/mature overnight, best for several days(follow the steps on how to color red and black royal icing above) before using on cookies. You can also add little bit of white food coloring also corn syrup to the icing. I find it helps with bleeding as well. About 1 tsp of corn syrup per 1 cup of icing. Use gel food colorings to color icing. I use Americolor Brand. Does royal icing stay soft or does it get firm as it dries? Royal icing dries firm it is not soft like buttercream frosting. Can I make my royal icing dry softer? You can add up to 1/3 cup of corn syrup per batch or royal icing. This makes for the royal icing to dry with a softer bite. Cookies decorated with royal icing have spots on them, what happened? This is called butter bleed/blotching. It happens from time to time. Butter bleed is really hard to fight so when this happens try not to panic. Over time butter bleed usually spreads over the whole surface of the cookie and makes the icing a little darker. Try to improve drying process by using fans. My icing dries dull, why? Icing dries dull? This is a pretty common problem. From my experience it is usually caused by a prolonged drying period caused by icing that is too thin. It takes longer to dry because of all the additional water used to thin icing. Or perhaps it is taking a long time to dry because of the weather/climate. Humidity has no mercy and can cause quite a cookie headache. Use tips on how to dry cookies to help speed up the drying process. How do you store decorated cookies? I store cookies, away from the direct sunlight, in the airtight container layered between wax paper sheets. How to package cookies for favors? I use poly bags and a Impulse heat sealer to seal my bags, this helps to prolong the shelf life of cookies. How long are decorated cookie good for? Generally 2-3 weeks if stored properly. How can I prolong the shelf life of cookies? You can add 1tbl food grade glycerin or agave nectar per batch. Both are hygroscopic and absorb moisture from air, keeping the cookies moist for longer. If packaged properly cookies will last for up to 4 weeks. Some decorators freeze decorated cookies with no issues and then others can experience issues. I’d suggest you experiment if a couple of cookies before you try to freeze whole 200 of them. Ideally you’d want to package your cookies in clear bags. Freeze cookies stacked in the freezer safe container vertically if possible. Then when defrosting the cookies, let them thaw on the counter in the container overnight. Problems that can occur include blotching or bleeding of colors. 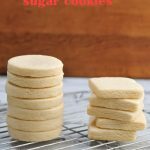 How to prepare cookies for shipping? Chose cookie cutter shapes that are less likely to break. Some of my favorites shape include : rounds, hearts, squares, cupcakes, plaques, strawberry shape (this one can be turned into 30 + different designs) Avoid shapes with long, thin, pointy sections as there are more like to break in the shipping. Make sure to use bubble wrap and line the bottom and inside walls of the box with the bubble wrap. Layer cookies into the box between sheets of bubble wrap, keeping little room between cookies so they are not touching but not too much of a room so they can’t shift too much while in transit. It is important to fill every corner with either extra tissue paper or bubble wrap or styrofoam packaging peanuts. Close the box and shake it. Do you hear and feel the movement inside of the box? If you do then you need to add more packaging material to prevent the shifting from occurring. What are you favorite tools to use with royal icing? Here is the list of tools I use the most. Do you have a question to which you don’t see an answer in my Royal Icing FAQ? Be sure to message me. Thank you so much for this. It really came in handy today. Really enjoy your site by the way. I have iceing color some time doing small areas. How do I fix it after 8ts dryed? Mary, I’m not sure what you mean? Could you please be more specific. Thank you. Thank you so much all this info is amazing! I meant Love your u-tube shows! Im sorry i dont kniw how to get to the sugar cookie recipe from here, can i check back here at the royal icing which i also use! Both lemon and without! Hi Linda, I'm thinking maybe try baking them for little longer, I wonder if they are still little soft inside and that is why break. Yes you can freeze icing. I usually let it come to room temperature before using previously frozen icing. Frozen icing become a little more fluid so I usually add little bit of freshly made icing to restore the consistency I need. Fresh icing, keeps well for at least 2 weeks in the fridge, always let it come to room temperature before thinking with water. Decorate cookies are good for 2-3 weeks. You can add 1tbl food grade glucose or agave syrup to keep them fresh for a little longer. Hope it helpw. Hi Haniela, when decorating your cookies, when you have to leave them out to dry because you may be doing a lot of decor and flooding on a cookie. from the cookie sitting out for hours to dry, does your sugar cookie dry out?? will your cookie still be soft and tasty? 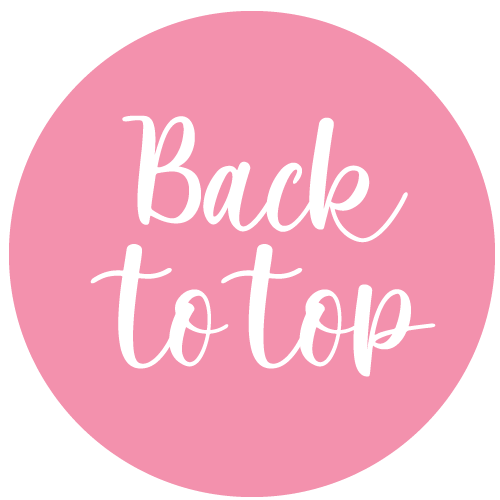 Just found your blog and I love it. For the red and black colors, when you let the color develop are you letting them rest in the fridge or at room temperature? Mine were in the fridge overnight with Amiericolor dyes and I didn’t see much change. I let them sit usually at room temperature when letting the color deepen. Thank you. 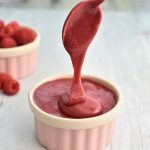 Is there a way to add other flavorings to this recipe? I want to add flavors like peppermint, almond extract, etc. to the icing to have other icing flavors available. yes you definitely can. I often add almond, coffee..strawberry etc. You can really play with flavors. I always start with vanilla though as mother of all sweet flavors. 🙂 A lot of ladies also use flavoring called Cookie Nip. I haven’t tried it yet. When it comes to flavorings makes sure they are either water based or alcohol, oil based flavors can cause icing to act funny when drying. Can you freeze royal icing decorated cookies? on most days I’d say I rather don’t freeze decorated cookies as it can be finicky to thaw them without blotching and bleeding of some colors. However I think you can if you follow few steps. Be sure to test it first before you freeze 100s of decorated cookies for your order/event. Allow icing to dry completely, package cookies in clear bags, layer them in into the freezer save container.If possible layer them vertically. Freeze for up to 1 month. Let them thaw in the container on the counter overnight. . I actually got them at a dollar store few years back. Maybe try walmart too. I usually recommend 2 weeks at room temperature as it starts to really separate and if not covered well sections become crusty etc. But that being said I have done the same as you on number of occasions. So for meringue based I’d say month is the most if kept at room temperature. If you see any sections that are crusted just chip those away and discard those and remix it well either with a spoon or I’ve also use immersion blender when I don’t feel like using a stand mixer. When icing goes bad at room temperature its has a sour smell. Gasses formed cause solids to expand and often it can cause the lid to pop. If you have no such symptoms and it tastes fine and there is no funny smell you are fine. Just use it ASAP. You are welcome. I updated section about the shelf life in the article, too. Thank you.